Three former Midwest League players — Dan Vogelbach, Matt Olson and Renato Nunez — made their major-league debuts Monday. All three played in the Midwest League in 2013. Vogelbach made his debut for the Seattle Mariners as a pinch-hitter in the 9th inning. He reached base on a fielder’s choice, and later was called out for missing second base while going from first to third on what would have been a single by Kyle Seager. The former Chicago Cubs prospect, who was traded to the Mariners for former Burlington Bees pitcher Mike Montgomery in July, made his first MLB start at first base Tuesday. He batted eighth and went 1-for-4, collecting his first MLB hit with a single to right field in the 6th inning. Vogelbach batted .284 with 17 HR and 71 RBI in 114 games with the Kane County Cougars. 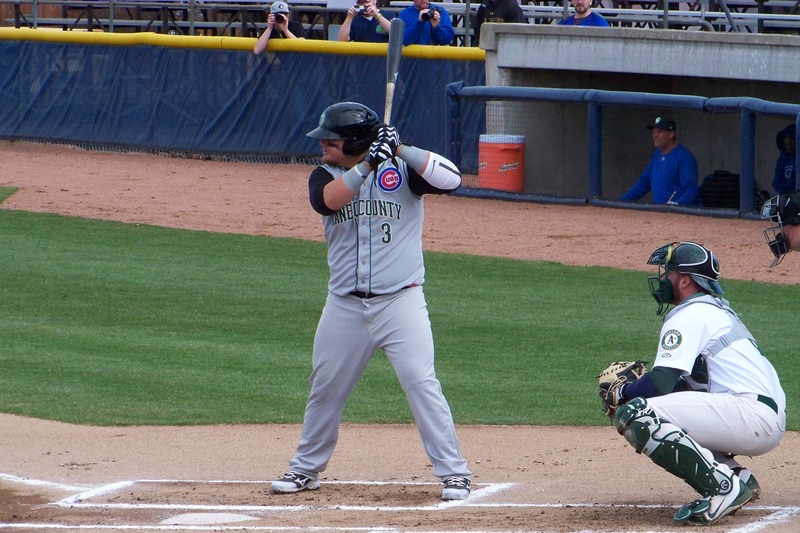 Dan Vogelbach played first base for the 2013 Kane County Cougars. Olson made his debut for the Oakland Athletics as a defensive replacement at first base in the bottom of the 8th inning. He drew a walk when he came to bat in the 9th inning. The A’s prospect batted .225 with 23 HR and 93 RBI in 134 games with the Beloit Snappers. 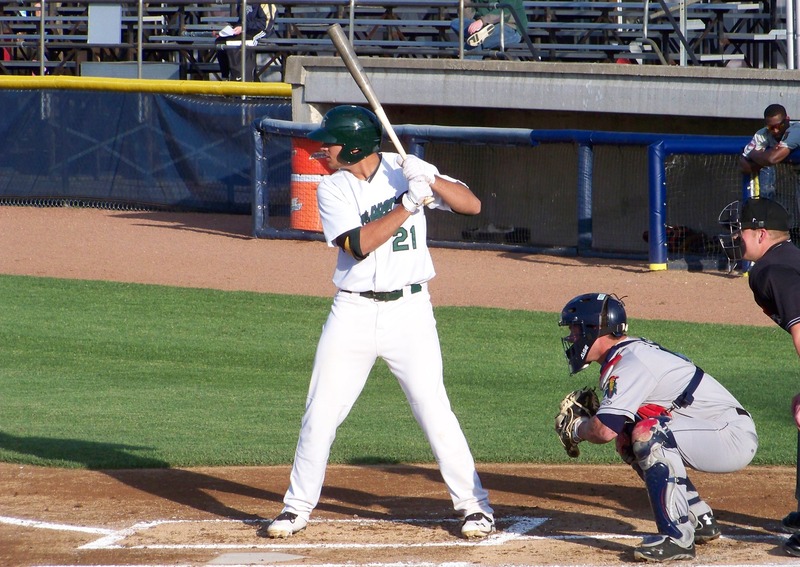 Matt Olson played first base for the 2013 Beloit Snappers. Nunez made his debut for the A’s as a pinch-hitter in the 9th inning. He grounded out to first base. He made his first MLB start as Oakland’s designated hitter Tuesday, and is still looking for his first MLB hit after going 0-for-3 in the game. Nunez batted .258 with 19 HR and 85 RBI in 128 games with the Snappers. 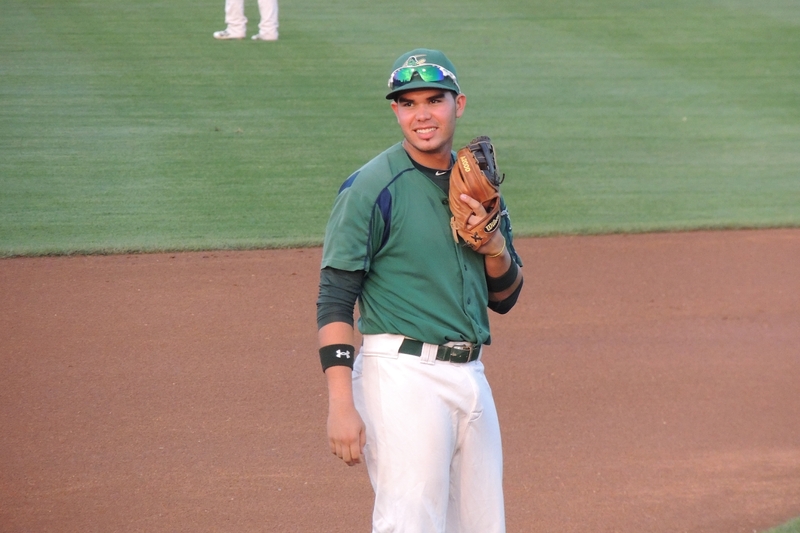 Renato Nunez played third base for the 2013 Beloit Snappers. This entry was posted in Beloit Snappers, Burlington Bees, Kane County Cougars, Midwest League. Bookmark the permalink.